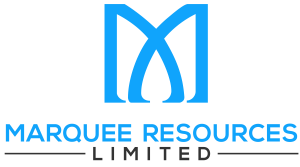 Marquee Resources Limited (Company) (ASX:MQR) refers to its announcements to ASX on 5 December 2017 and 16 February 2018. The Company is pleased to announce that, following shareholder approval at today’s general meeting, the acquisition of Canadian Co27 Pty Ltd (Co27) from Syracuse Capital Pty Ltd (Syracuse), Jet Capital Pty Ltd (Jet Capital), Vonross Nominees Pty Ltd (Vonross) and Ninety Three Pty Ltd (Ninety Three) has completed. Further, the Company confirms that completion has occurred under the agreements for the Werner Lake Project, the Werner Lake / East Project and the Skeleton Project. In accordance with the agreements, the Company will issue a total of 11,000,000 shares between the relevant sellers. The final number to be issued to Global Energy Metals Corp. (GEMC), the Trustee, Jet Capital, Vonross and Ninety Three will depend on the 6 day volume weighted average price of shares (VWAP) from today until 28 February 2018 (inclusive). Approximate and hypothetical splits of the shares to be issued based on certain VWAPs is set out below. The issue of shares is anticipated to occur on or about 1 March 2018. As stated in its announcement to ASX on 16 February 2018, the Company will soon convene another general meeting seeking shareholder approval for the transfer of the shares to be held by the Trustee to Syracuse (subject to escrow requirements). This approval will be sought for the purposes of item 7 of section 611 of the Corporations Act. The shares to be issued to Syracuse and the Trustee will be subject to ASX imposed escrow for a period of 12 months from the date of issue. Each of Jet Capital, Vonross and Ninety Three have agreed to enter into voluntary escrow deeds for a period of 12 months in relation to the shares to be issued to them. As previously flagged, Mr Jason Bontempo has today tendered his resignation from the Company due to a non- compete clause in his employment contract with another cobalt company. The board of Marquee wishes to thank Jason for his dedication to Marquee over the past twelve months and wishes him all the best with his future endeavours. The board is pleased to announce that Mr George Henderson has today been appointed as a non-executive director to replace Jason. George is a corporate lawyer with over 7 years of experience. He is currently a Partner in the corporate team at Edwards Mac Scovell. George primarily works in mergers and acquisitions, capital raisings and regulatory compliance, and has particular experience in the resources sector. George graduated from the University of Western Australia with degrees in Law and Commerce (Corporate Finance and Financial Accounting). The company’s focus will now shift to an aggressive exploration and further resource delineation program at the Werner Lake project.